The production of conventional and unconventional hydrocarbons can be affected by several sources of damage under subsurface conditions that can hinder well productivity. Damage may occur during different stages of oil and/or gas well formation such as production, drilling, hydraulic fracturing, and workover operations. For years, formation damage was considered negligible or was not treated adequately, causing reductions in the production rate up to the loss of both producer and injector wells. Nowadays, formation damage is an essential parameter to be considered in the wells’ development as its prevention and/or engineered remediation may lead to cost reduction and improvement of production rate. Formation damage is challenging in the oil and gas industry, as it implies a large number of mechanisms that can be involved. Different fields feature problems associated with fines migration, asphaltene precipitation/deposition, inorganic scales, condensate banking, and damage during hydraulic fracturing operations, among others. Nanotechnology is a rapidly growing technology with potential applications and benefits. Among the numerous applications of nanotechnology for energy and the environment, the nanoparticle technology could be successfully employed as an attractive alternative in the oil and gas industry for the inhibition and remediation of different types of formation damage with cost-effective and environmentally friendly approaches. Due to their exceptional physicochemical properties such as high dispersibility, high surface area/volume ratio and small size (1-100 nm), nanoparticles are able to inject into the reservoir, travel smoothly through the porous media and selectively attack a specific type of formation damage. Also, at the nanoscale, other exceptional properties can be obtained, such as high thermal stability and chemical stability, as well as optically, magnetically, and electrically tunable properties. 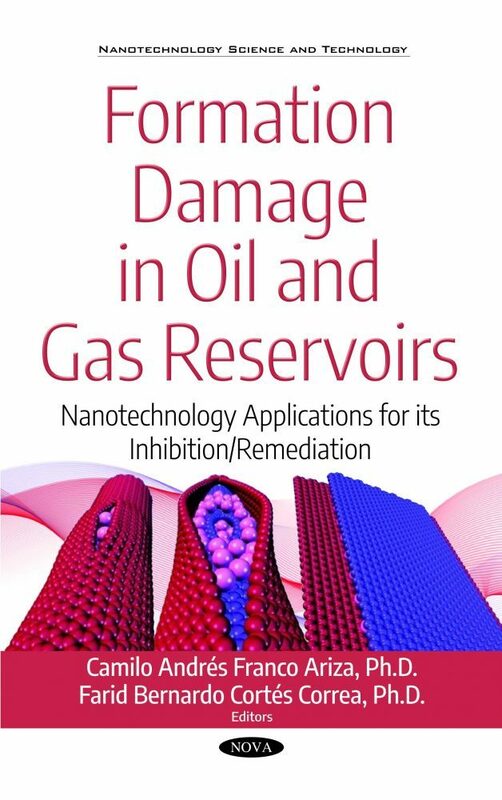 This book provides recent research on nanotechnology applied to the inhibition/remediation of formation damage in oil and gas reservoirs. The chapters include methodologies for multi-component skin characterization, estimating the level of risk of formation damage, nanoparticle fabrication methods, as well as the application of nanoparticles and nanofluids at both laboratory and field conditions. This book should generate a better landscape about the use of nanoparticles and nanofluids in the improvement of inhibition and treatment of formation damage, and its application in local and international scenarios.